Remember last time my husband said he wanted to have laksa? He actually also said he wanted curry fish too. And He even chose fish filet for me to cook curry fish. Which is really rare, since my husband used to only choose snacks, diary products, and drinks. And he chose me stingray fish fillet. Well, that’s a bit challenging for me, since I have never cooked curry fish before, not even curry stingray fish. But my husband was like over confident with me. “Just cook it in the way how you cook curry chicken lah.” It’s easy to say those words, especially from a man who never cooks. Anyway, I gave it a try. But not same as the way I cooked curry chciken. Cut sting ray fish fillet into smaller chunks. Sting ray has soft bone, which makes cutting a lot easier. Heat a pan, add in 1 tbsp oil. Fry fish fillet with low-medium heat till both sides turn golden brown. Then set aside for later use. Chop 1 onion, 4 garlic cloves and a small pieces of ginger and red chili (according to how spicy you can accept). Chop them as fine as you can. When I lose my patience, I jut chop them coarsely. Heat the pan again. Add in another 1 tbsp oil. Put all the chopped ginger, garlic, chili and onion in. Saute till aromatic. Add in 2 tbsp curry powder. saute a bit. Pour into 1/2 1 cup water or stock. Bring to boil. Add in potato chunks (my husband specifically said he wanted potato in this curry fish) , chopped 2 medium tomatoes and 1 tbsp tomato sauce. Lid on and simmer with low heat for 15 mins. Add in chopped long beans and green chili. Simmer for another 5 mins. Add fried fish fillet in. Also add in 200 ml coconut milk. Stir evenly and simmer for another 10 mins. 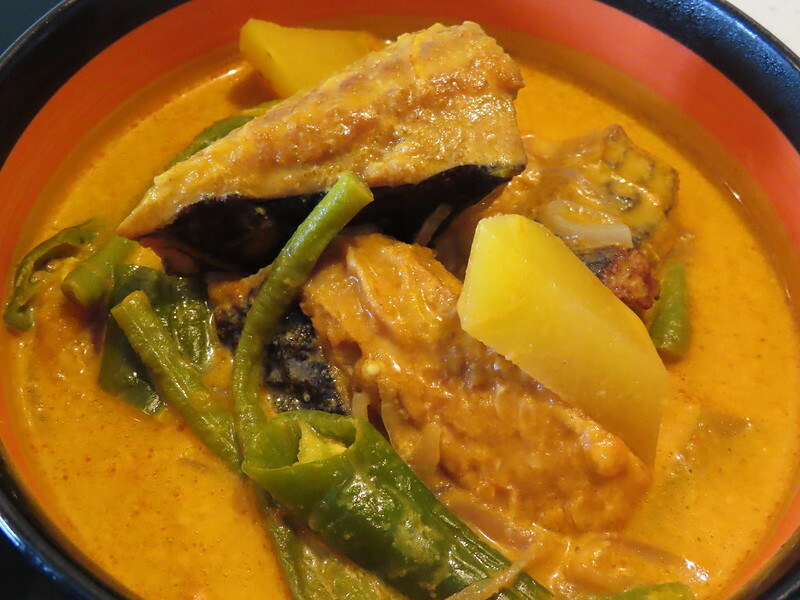 My husband is pretty satisfied with this curry fish dish. 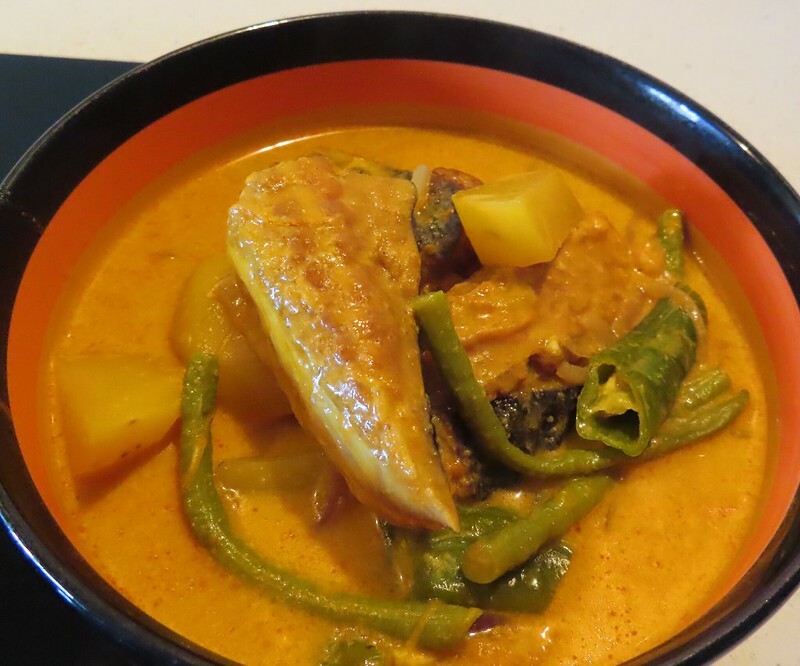 ‘“Just cook it in the way how you cook curry chicken lah.” It’s easy to say those words, especially from a man who never cooks.’ Ha Ha – so typical!